Damn, they're onto us. May as well come clean and invite them all down to my local pub for a few drinkies. Nothing there will surprise or shock them, as it turns out: it's as though they've been regulars all along. First round's on me. "Tired of the fray? Just want to kick back and exchange war stories with friends and comrades? 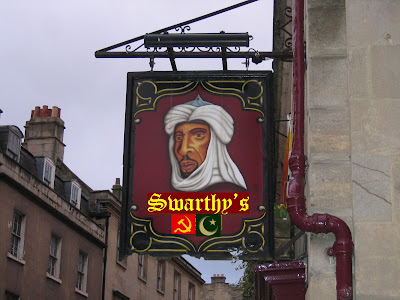 Join us at Swarthy's, where leftists and Islamofascists can take a break from the struggle and relax in pleasant company. "Why not take part in the lively discussions at the bar? Whether it's homosexuality, women's rights, evolution, materialism, capital punishment, democracy or Israel's right to exist, laughter and good fellowship are the order of the day. We provide back rooms for private parties and meetings, and a wide-screen TV with continual Al-Jazeera news reports and commentary, produced by former CBC heavyweights Tony Burman and Avi Lewis. Enjoy the latest defeats of the Great Satan in a warm and welcoming atmosphere. "Chill out at Swarthy's, where East meets West and every hour is happy hour. We look forward to serving you." This page contains a single entry by Dr. Dawg published on August 6, 2008 8:35 AM. Guantanamo: the US finally comes clean was the previous entry in this blog. Ezra loses another round is the next entry in this blog.